www.motoonline.com.au Alex Gobert Image: Marc Jones. Faith and McLeary extend 250 class advantages. Team Motul Suzuki’s Matt Moss has made it three-straight Penrite Australian Supercross Championship round victories to open the 2014 season, winning round three this evening at Phillip Island alongside the Tissot Australian Motorcycle Grand Prix. 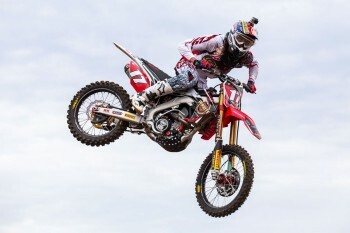 Moss again dominated the SX1 ranks with both of his heat race wins, going on to lead all 20 laps of the action-packed main event on board the 2015 model RM-Z450. Lawson Bopping (Team Motul Suzuki) came from the lower-end of the top five, in an improvement on his starts from Bathurst, to claim an emphatic 1-2 for Suzuki in the runner-up position, while multiple-champion Jay Marmont (Penrite Honda) scored an emotion-charged third. Bopping made his move stick on Adam Monea (NPS Monster Energy Kawasaki) during lap seven, and then moved past Jake Moss on the other factory Kawasaki one lap later – setting his sights on new teammate Moss out front. He wasn’t able to make major inroads however, finally finishing 3.783s in arrears. “It was a night tough tonight, ” Bopping said. “It was a really hard 20-lapper. I am stoked with my result and the team is awesome. I will go home and rest so I am ready to come back and do it all again tomorrow. Behind the Suzuki duo it was a tight fight for third, with Marmont using his unrivalled experience to claim the spot comfortably in the end from former teammate Monea, as KTM factory riders Kirk Gibbs and rookie Jesse Dobson were a fine fifth and sixth. Suzuki-mounted privateer Sam Martin was the final rider to finish on the lead lap in seventh, as Josh Cachia (Husqvarna Motocross Racing Team), James Booth-Elliott (Suzuki) and Kieren Tisdale (Raceline Suzuki) rounded out a mixed top 10. After running in a podium spot early, Jake Moss’ end result of 13th again didn’t show his true potential, nor did Kade Mosig’s (DPH Motorsport Yamaha) 15th position – both encountering difficulties in the closing laps. Defending champion Matt Moss now holds a handy 13-point lead over Monea in the standings, with Bopping closing to within two points of him in third. In the 15-lap SX2 main event, it was Kale Makeham (Tunetech Racing KTM) who led the early laps, until Penrite Honda’s Gavin Faith took charge on lap five and was never headed – claiming his second win of the season in succession by a commanding 9.582s margin. Behind 2012 champion Faith, countryman Kyle Peters (Wilson MX Honda) nabbed his second podium of the year to make it an American 1-2 after working his way forward from ninth on lap one, and Makeham rounded out the podium – also his second of the season. Raceline Suzuki rider Hayden Mellross claimed fourth from opening round winner Brenden Harrison (Instant Security KTM), which results in Faith now leading the series by 11 points from both Peters and Harrison tied in second. The three-race SXD overall was won by Brock McLeary (KTM Newcastle) for the second weekend in a row, as his consistent effort of 3-1-3 finished held out race two winner Jack Simpson (Davey Motorsports KTM) and Dylan Wills (KTM Newcastle), who won the final race of the round. Victorian Tomas Ravenhorst (KTM) and Aaron Tanti (Sutto’s KTM) also featured strongly throughout the Phillip Island round, eventually capping off the top five overall. Sweeping the Junior Lites proceedings with three wins from three starts was Jordan Hill (Yamaha Junior Racing), the win over Travis Silk (KTM) and Lachlan Holroyd (Yamaha) extending his championship advantage. Round four of the series will be hosted on race-day Sunday alongside the Tissot Australian Motorcycle Grand Prix tomorrow at Phillip Island. Note: All results provisional at time of posting.